A selection of work from Host 4: Cinema was included as part of The Sheffield Pavilion 2007, a publication and DVD commissioned and produced by Sheffield Contemporary Art Forum. The pavilion was launched at Documenta XII and the 52nd Venice Biennale. Published by Cornerhouse, copies are available from the Cornerhouse bookshop and directly from SCAF. 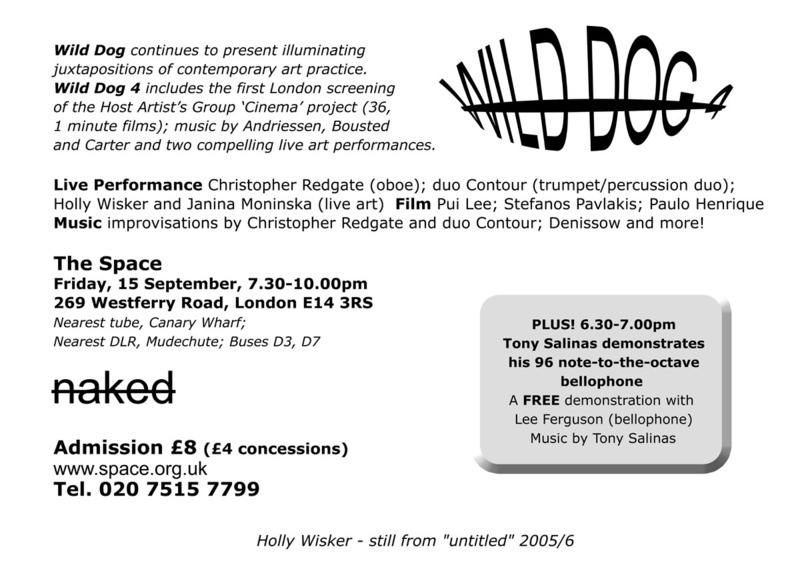 Host 4: Cinema receives its first London screening on 15th September 2006 at The Space as part of the Wild Dog 4 event. Flyers downloadable here, here and here. Tickets are available from the venue. Also, here is a french language review of the Annonay screening. Host 4: Cinema receives its second screening in mainland Europe at Consortium, Amsterdam as part of the Jeez exhibition. A limited number of DVDs will be on sale on the night. A selection of work from Host 4: Cinema was shown on the BBC's Big Screen in Clayton Square, Liverpool as part of the 37 Seconds programme. Work by Host artists was screened alongside work by international artists Imogen Stidworthy and Christian Jankowski. Host 4: Cinema was shown in Annonay, France during Le Festival: Nouvelles images part of Le Festival International du Premier Film between 4th February 2006 and 17th February 2006. Le GAC (Group of Contemporary Art) is one of the two curators for the event. A link to a review will appear here soon! Host 4: Cinema to be screened at Side Cinema, Newcastle upon Tyne, on the 10th June 2005. Host 4: Cinema to be screened at the Cornwall Film Festival, Falmouth Arts Centre, 12th–14th November 2004. Welcome to the new Host 4: Cinema microsite. This site contains details for all of the artists taking part in the show, as well as a hub for screening info and DVD sales. Hope you enjoy it!